LEGO stop-motion films or ‘brick films‘ are a popular way to bring LEGO to life. Brick films often feature minifigures and depict movie scenes or action moments using LEGO. Andrea, an Italian fan of LEGO, has employed a stop motion method that is certainly unique. His film shows the smooth creation of a build by Massimiliano Marino. 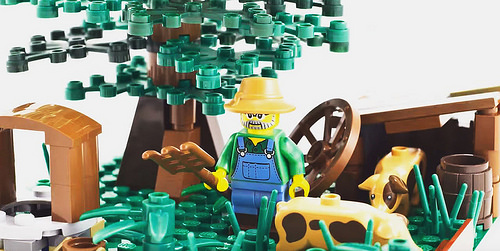 The final creation centers around the Farmer minifigure who appears in Collectible Minifigure Series 15 along with his pig. The creator Andrea plans further stop-motion fan builds on his YouTube channel AnkTales. The great thing about a stop-motion video of a build is that you can remember how to build it long after it has been deconstructed and the bricks used for the next project, not to mention letting other builders take a look at the construction process.